The Jewish Community Day School of Rhode Island (JCDSRI) is a co-ed, elementary school from grades preK to fifth grade. We are committed to providing a warm, inclusive and joyous environment for our children by offering a progressive curriculum based on curiosity, creativity, and integration between general and Judaic studies. We currently have 73 students from diverse socio-economic and denominational backgrounds. JCDSRI’s administration mirrors the values of a “student centered school” by modeling a “teacher centered” administration, meaning most of the initiatives and many of the decisions are made by and through teachers. Our space is a former classroom divided into a main working room and a back storage room. The main working room is open, with tables available to set up when needed. 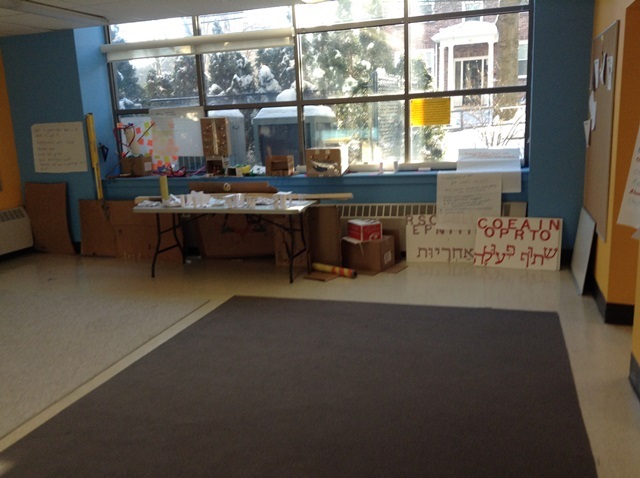 On one side of the room we have a supply area with various recyclable materials, markers, glue, etc. The openness of the space allows students to spread their bodies out and work collaboratively. Our program is still in its infancy, as this is only the second year we have had the design lab, and we are still iterating, ourselves, on what we want this space to be. Up until now, we have approached our design lab time from a STEAM (science, technology, engineering, art, and math) lense. All of our students have “Design Lab” time once a week for 50 minutes. During this time, our Design Lab/technology specialist prepares lessons/projects for the students. Other times, general and Judaic studies teachers take their kids to the space to create scenery, to build things, and to make costumes. Teachers use the design lab to add richness to their in-class work. We do various types of projects in our Design Lab in grades Pre-K through 5th grade. We try, whenever possible, to connect what our students do in Design Lab to what they are learning in class. Other times, we teach about the design process. We focus on brainstorming, framing, prototyping and reflecting. For example. with our older students, we completed the “school supply case” challenge, where students had to find a user and create a school supply case specifically for that user. Through this project, we went through the entire design process. Other times, we use technology to enhance what students are doing in the classroom OR to create new digital media. For example, our third graders are using the iPads to create a movie that goes along with fantasy stories they wrote in class. Another example of using technology is when our 4th and 5th graders created professional looking posters for our spirit week. Through these projects, students practice the design process. In the younger grades, we work more on creativity and problem solving through literacy-connected projects and science related units. For example, in preK and K, we read the book “Big Smelly Bear”, then students had to create a backscratcher to help the bear scratch his back. First and second graders are learning about simple machines and creating things like catapults, and cars. Throughout the creation of these projects, students continue to reflect go through multiple iterations. Currently, the fourth and fifth graders are working on a huge Rube Goldberg machine. Stay tuned! JCDSRI is currently developing its Maker Space/ Design Lab curriculum and is working collaboratively with the Brown/ RISD STEAM club. We are looking forward to our first STEAM week from April 20-24th, 2015 which will be a joint effort between the JCDSRI staff and the students of Brown/RISD steam. In the next year, we are looking to expand our Maker space/Design Lab by giving it a larger physical space, add more wood-working tools, and by continuing to develop the curriculum through adding more technology integration.